Some stress protocols show a pro-inflammatory response in the brain and other systems characterized by a complex release of several inflammatory mediators such as cytokines, transcription factors, prostanoids and free radicals. Such response might contribute to cell damage during several neuropsychiatric diseases related with stress (post-traumatic stress disorder, major depressive disorder, anxiety disorders, and schizophrenia). In particular, data from the clinical arena associate an increase in proinflammatory mediators with major depression. This review considers the current status of knowledge of stress-induced inflammation in the brain. Interestingly, anti-inflammatory pathways are also activated in response to stress, constituting a possible endogenous mechanism of defense against excessive inflammation. Both in brain and digestive tract, stress exposure switch on a compensatory anti-inflammatory mechanism, the synthesis of deoxyprostaglandins. Pharmacological stimulation of its nuclear receptor, the peroxisome proliferator activated receptor (PPAR) gamma, prevents stress-induced inflammatory and functional damage both in the brain and in the digestive tract. This dual response deserves further attention in order to understand pathophysiological changes and possible new therapeutic approaches of stress-related neuropsychopathologies. The physiologist Hans Selye first defined the physiological responses to stressors and adapted the term stress from physics and engineering to introduce it in the medical vocabulary. He was the first to use the terms stress and “stress response” in a medical context . This response, consisting of a three-phase mechanism, is the result of an adaptation necessary to allow the overcoming of situations in which an organism has to “fight or flight” to survive (e.g. higher blood pressure, faster cardiac rhythm, suppression of the digestive processes, or re-direction of blood to muscles). Nowadays, the stress response is considered a characteristic set of physiological, affective, cognitive and behavioral changes that can have costs for well being whether or not successful adaptation is achieved. Stress is a dual phenomenon, since while this fast and reversible response is essential for survival, it may cause adverse effects when secretion of the stress hormones are sustained . In this way, the “stress hormones” production during stress response is very similar to the inflammatory process, generated in an organism when is invaded by certain micro-organisms or after trauma or tissue damage. Both responses are closely related and are preserved during evolution . The stress response begins with nervous impulses from the cerebral cortical centers when they perceive certain environmental stimuli through the specific sensorial systems or recall certain stressful experiences (being these real or unreal). These stimuli propagate to the limbic system, and induce the release of corticotrophin release hormone (CRH) in the paraventricular nucleus (PVN) of the hippocampus. CRH is released to the venous system reaching corticotrope cells of the anterior pituitary gland  which, once stimulated, produce pro-opiomelanocortin (POMC), a precursor macropeptide that will be converted to the adrenocorticotropic hormone (ACTH), beta-endorphin and the melanocyte stimulatory hormone-alpha (MSH-alpha). The released CRH stimulates the locus coeruleus neurons in the brainstem to release noradrenaline (NA) at the nerve terminals distributed throughout the central nervous system (CNS) . Stress is also able to stimulate the sympathetic nervous system (SNS), particularly fibers that innervate the adrenal medulla, activating the chromaffin cells to produce adrenaline. ACTH acts on both fasciculata and reticularis zones of the adrenal cortex to synthesize and secrete glucocorticoids (GCs) , which, along with the catecholamines released by the stimulation of the SNS are the main “stress hormones” (others are also considered, but with secondary importance, such as glucagon and growth hormone). These glucocorticoids inhibit the HPA axis activity, by negative feedback mechanisms, and by binding to their receptors in the pituitary gland, hypothalamus and medial prefrontal cortex [7,8], blocking the CRF secretion and therefore the release of ACTH in the pituitary gland. Although the main mediators of stress response, glucocorticoids, are universally considered as anti-inflammatory agents in the periphery, in the recent years this classic view has been challenged at a variety of levels, mainly in the CNS (reviewed in reference 9). Thus, in the brain, GCs are not uniformly anti-inflammatory, and can be even pro-inflammatory. It has been shown at the levels of cell extravasation and migration, inflammatory messenger levels, and at the transcription factor level . In the CNS, prior exposure to GCs can result in a “priming” of the immune response to a subsequent inflammatory challenge (the inflammatory stimulus is higher than expected when exposure to GCs does not take place). For example, a model of chronic unpredictable stress (different stressor each day) in rats, increases levels of the inflammatory cytokines, interleukin (IL-1)-beta and tumor necrosis factor (TNF)-alpha following infusion of LPS (lipopolysaccharide, an inflammatory compound found in the wall of Gram negative bacteria, responsible for sepsis in humans, used as inflammatory challenge) into the prefrontal cortex , as compared to LPS alone. Even more striking, unpredictable stress augments TNF-alpha, IL-1beta, and protein levels of one of the main oxidant enzymes, inducible nitric oxide synthase (iNOS) in the hippocampus and cortex when LPS is administered peripherally, an effect that is glucocorticoid receptor (GR)-mediated . Similarly, stress levels of corticosterone exacerbate excitotoxin-induced increases in IL-1beta and TNF-alpha mRNA and protein levels both in vivo and in vitro [12,13]. Inflammation is a complex set of coordinated mechanisms governed by the interaction of multiple specific mediators (cytokines, prostaglandins, chemokines, etc) released by different types of immune cells. In spite of the presence of the brain-blood barrier (BBB), the brain responds to peripheral inflammatory stimuli mounting a local inflammatory response, called neuroinflammation, and generating HPA axis activation, and other acute phase responses including lethargy, somnolence, fever and anorexia, referred to collectively as “sickness behavior”, aimed to maintain the body’s homeostasis threatened by injury or infection . The inflammatory process is a protective mechanism, conserved during evolution in all types of organisms. However, when it is excessive in intensity (over expression or over activity of its mediators) and time (inefficient resolution), it becomes harmful and can exacerbate numerous diseases. In spite of being the CNS an immune- and inflammatory privileged organ (mainly by the presence of BBB), there is extensive evidence that an excessive inflammation within the CNS contributes to many acute and chronic degenerative disorders such as Parkinson’s disease (PD), Alzheimer’s disease (AD); and others . In addition, an increasing body of evidence indicates its role in some psychiatric diseases such as depression, post-traumatic stress disorder and schizophrenia [16,17]. Some of the known mechanisms by which stress increases neuronal damage are: 1) energetic metabolism disruption by inhibition of glucose transport in neurons and glia and consequent depletion of ATP levels ; 2) increase of susceptibility to excitotoxicity by increase of extracellular excitatory neurotransmitter glutamate  and 3) oxidative/nitrosative mediators accumulation such as the free radical nitric oxide (NO), prostanoids, due to activation of enzymes responsible of their synthesis and proinflammatory transcription factor, the nuclear factor kappa B (NF−kappaB) . Activation of NF−kappaB is one of the earliest events in the stress-inflammation response. It controls the transcription of many of the acute phase proteins and inflammatory genes (20). We demonstrated experimentally for the first time that stress activates NF-kappaB in the brain. This occurs very early after the beginning of stress , and later studies showed this activation in humans too, with psychological stress (free speech and a mental arithmetic task) . NF−kappaB produces the expression of genes responsible for the accumulation of oxidative/nitrosative and inflammatory mediators that finally contribute to cell damage or generate reversible or, in chronic conditions, even irreversible cellular damage. This makes NF-kappaB a very interesting new target for a therapeutic approach. Two main sources of oxidative/nitrosative mediators and inflammatory damage after stress dependent of NF-kappaB are inducible NO synthase (iNOS), which produces NO and peroxynitrite, and cyclooxygenase-2 (COX-2), which produces prostanoids. – Inducible NO synthase, iNOS, is an enzyme that has been implicated in citotoxicity phenomena in a variety of pathological process such as AD, PD, and Huntington´s disease [23,24] due to the amount of NO released when it gets activated. This gas is a very reactive molecule that can react with other oxidative species such as O-2 to generate peroxinitrite ONOO-, which is responsible for the membrane damage by lipid peroxidation attack. Exposure to stress induces an increase in expression and activity of this enzyme in various brain areas (e.g., cortex and hippocampus) . – Cyclooxygenase 2 (COX-2) is an isoform of the enzyme cyclooxigenase that is responsible for the synthesis of prostanoids at high levels during pathological process with a clear inflammatory component . COX-2 activation is not only toxic, due to release of certain toxic prostanoids (like PGE2 which in brain is able to induce the release of glutamate  and generate cellular death by apoptosis ), but because during this synthesis free radicals are generated contributing to oxidative/nitrosative damage . In addition to glucocorticoids or excitatory amino acids that are released during the first stages of stress exposure in the brain, there are also some inflammatory cytokines that are produced after stress exposure [30-37]. Cytokines are soluble bioactive mediators released by various cell types both at the periphery (macrophages and lymphocytes), and in the brain (astrocytes and microglia), which operate within a complex network and act either synergistically, or antagonistically, and that are generally associated with inflammation, immune activation and cell differentiation or death. These include interleukins (IL), interferons (IFN), tumor necrosis factors (TNF), chemokines and growth factors . The best studied ones in the pathophysiological basis of stress response are the proinflammatory cytokines TNF, IL 1 and 6. These cytokines are produced at inflammatory sites, and can stimulate their own secretion from the cells producing them. Interestingly, they can also activate the HPA axis, resulting in a positive feedback loop. One of the proposed mechanisms by which glucocorticoids help to prevent an over stimulation of the HPA axis is by inhibiting the production of these cytokines . TNF is a group of cytokines that is comprised of two forms, namely α and β, which are derived from two different genes. Many studies have been focused on the α form, because its production is increased in the CNS after damage due to traumatic injury, ischemia, infections or diseases that involve brain degeneration, playing an important role in the adaptive response to these conditions. However, TNF-beta can also be produced in excess causing tissue damage . TNF-alpha is released in its soluble form from its membrane bound precursor by a membrane-anchored zinc metalloproteinase TNF-alpha convertase (TACE). Like other cytokines, TNF-alpha exerts its effects by binding first to specific surface receptors on target cells. There are two types of TNF receptors: the p55 and the p75 also called TNFR-1 and TNFR-2 respectively . TACE cleaves pro-TNF-alpha from the cell surface releasing the mature form from the cell membrane . Studies by Western blot analysis have shown constitutive expression of TACE protein in microglial cells and some astrocytes in the rat brain [42-44]. The human brain also appears to express high levels of TACE in neurons, astrocytes and endothelial cells . The activation of TACE/TNF-alpha has been shown as one of the early consequences of exposure to stress in the brain: with just 30 minutes of restrain stress, TACE enzymatic activity in brain cortex is increased . As predicted, a larger release of TNF-alpha has been found in brain cortex samples obtained from stressed rats. Whereas the activity of TACE was increased after half an hour of immobilization, the levels of soluble TNF-alpha were raised one hour after the onset of stress . The implication of TACE in this process was demonstrated by the reduction of the TNF-alpha levels in stressed animals treated with TACE inhibitors [46,47]. Interleukin-1 beta (IL-1beta) is a pro-inflammatory cytokine that has been identified as an important mediator of neurodegeneration induced in multiple neuroinflammatory conditions . Following CNS damage, IL-1beta is rapidly released from activated microglia. The actions of IL-1beta in the CNS are diverse and include induction of growth factors, reduction of glutamate release, enhanced gamma-aminobutyric acid (GABA) effects, modulation of neuronal responses to N-methyl-D-aspartate (NMDA) and glycine, and increased activation of iNOS. Furthermore, as an early cytokine, it increases the production of other cytokines, such as IL-2, IL-6, and TNF-alpha, contributing to inflammation . As mentioned above, the release of catecholamines in the stress response has been associated with the induction of stress-induced pro-inflammatory cytokines and beta-adrenoceptors are critical for tissue IL-1beta induction . Thus, a well documented case of pro-inflammatory cytokines induced by stress is IL-1beta. Many studies show that exposure to certain acute stressors (immobilization, inescapable tailshock, escapable tailshock and footshock) can potently increase the expression of IL-1beta in the CNS, being the hypothalamus the principal site where such changes are observed [51-55]. This IL-1beta mediates some of the responses that occur during stress such as monoamine and glucocorticoid release, cognitive impairments and “depressive-like” behaviors [56,57]. Interleukin 6 (IL-6) is a pleiotropic cytokine produced by immune and nonimmune cells. Increased production of IL-6 has been associated with disturbances of homeostasis, such as trauma, sepsis, or inflammatory diseases. In sepsis and local inflammation, IL-6 is considered to be a final common mediator in the cytokine cascade to hyperthermia [58-60]. Tissue injury, or immune inflammatory reactions as well as physical (e.g., infection, trauma) or psychological stress, these are known to cause increased production of IL-6. In the case of psychological stress (footshock and immobilization), plasma concentrations of IL-6 are increased [61-63], and also brain levels induced by previous release of IL-1beta . Finally, it has been described that IL-6 acts as a neuromodulator that is able to down regulate anxiety . However, these results need further studies, because a more recent study has proved that feeding, exploratory, anxiety- and depression-related behaviors are not altered in interleukin-6-deficient male mice . Indeed, IL-6 (as a pro-inflammatory cytokine) shares many actions with IL-1beta and for example, inhibits cell death when administered intracerebrally to rodents that are exposed to ischemic or excitotoxic insults. And by contrast, mice that over-express IL-6 show marked neurodegeneration, which indicates that chronic IL-6 expression has neurotoxic effects . MCP-1 is a CC type of chemokine. Chemokines are small (8-14 kDa) peptides mainly known by the essential role they play in cell migration and intercellular communication. They are produced in various tissues, brain among them, and act through their interaction with G coupled receptors. Currently about 50 different chemokines and 20 chemokine receptors have been identified. They were initially described as inducible cytokines that facilitated the recruitment of certain leukocytes to the inflammation sites. However, we now know that they also regulate certain cell activities such as adhesion, apoptosis, proliferation, phagocytosis, angiogenesis or metastasis . For MCP-1, besides its chemo-attracting action for inflammatory response-involved cells, recent investigations show other actions such as their ability to attract neuronal progenitors towards injured brain areas [68,69], or the regulation of blood brain barrier permeability . This, in addition to discovering that MCP-1  and its main receptor (CCR2)  are constitutively expressed in neurons in multiple brain areas, recent findings suggests that MCP-1 can act as a modulator of neuronal activity and neuroendocrine functions. Because of this, there has been an interest into the study of the possible protective role this chemokine may have: this possibility is partially confirmed by various studies [73,74] showing that MCP-1 inhibition on subunit 1 of the NMDA (N-methyl-D-aspartate) receptor (NMDAR1), and its protective effect against neuronal apoptosis caused by glutamate. Therefore, it is possible that MCP-1 compensates the increase of glutamate produced in inflammatory processes (excitoxicity), such as Alzheimer’s disease by reducing NMDAR expression. This hypothesis is in part confirmed by the observed induction of MCP-1 caused by NMDA treatment in organotypic cortico-striatal cultures , and in rat brain . After observing MCP-1 induction by NA in astrocytes, we decided to analyze if this chemokine is involved in the effects NA has on neurons. Therefore, based on Joan Berman’s group work, according to which MCP-1 protects mixed neurons/astrocytes cultures against HIV-tat and NMDA , we checked that the MCP-1 released by astrocytes protects primary neuronal cultures against excitotoxic injuries (NMDA, glutamate or ischemia), and that MCP-1 blockade reduces the neuroprotective potential of NA . These data seem to prove a dual role for this chemokine: there are some articles showing that the suppression of MCP-1, and the subsequent reduction in the number of immune response-associated cells attracted by MCP-1 can reduce the damage produced by the release of toxic and/or pro-inflammatory agents [78,79]. However, although MCP-1 over expression can have negative consequences for the nearby cells, strategies aiming at elimination (or even at a large reduction of activity) of this chemokine do not reduce certain inflammatory processes. In fact, there are studies showing the lack of beneficial effects resulting from MCP-1, or its main receptor CCR2 suppression [80,81]. The activity of MCP-1 and other chemokines seems to be important since it allows for the right functioning of the immune defense. Our experience suggests that (as well as for many other agents involved in brain inflammatory processes) while an excessive/uncontrolled MCP-1 expression is not desirable, the proper modulation of its expression facilitates viability for the surrounding cells. Meaning that MCP-1 over-expression does not seem to protect against amyloid beta (Aβ) accumulation in transgenic mice (Tg2576), but it facilitates the accumulation of Aβ oligomers in microglia . On the contrary, MCP-1 receptor (CCR2) elimination in the same type of mice, accelerates Aβ accumulation and causes their premature death . In order to analyze if the physiological elevation of NA levels in brain alters MCP-1 expression, we exposed rats to a stressing stimulus, a process known to elevate NA concentration in brain . But the mere exposure to the stress protocol used did not significantly modify MCP-1 concentration. However, when the synthesis of glucocorticoids was blocked with metyrapone, a large increase in the concentration of MCP-1 was detected . Certain in vitro studies have described the ability of glucocorticoids to inhibit MCP-1 synthesis in cell types like fibroblasts  or microglia . Accordingly, other in vivo studies described similar effects in hippocampus , or peritoneal cells ; this has also been used to explain the anti-inflammatory properties of these hormones. We were able to confirm the inhibitory effect of corticosterone on MCP-1 production in astrocytes. This is in agreement with the observed increase of brain MCP-1 after stress, caused by metyrapone, and suggests that glucocorticoids and noradrenaline have opposite effects on MCP-1 production during the stress response. All organisms have complex defense mechanisms that allow them to adapt to and survive stress and, despite stress can trigger an inflammatory response, one anti-inflammatory mechanism that has received great interest in the literature during the last years is certain cyclopentenone prostaglandins derived from the differential activation of COX isoforms by different physio-pathological stimuli. This latter mechanism is beginning to be considered as a possible local endogenous regulator of the inflammatory response in neurodegenerative conditions and has received considerable attention from the neuroimmunology field. The most thoroughly studied anti-inflammatory prostaglandin (PG) is the 15-deoxy-prostaglandin J2 (15d-PGJ2), a structural, non-enzymatic derivative from the PG D2. This PG is the proposed endogenous ligand for the gamma isoform of the subfamily of peroxisome proliferator-activated nuclear receptors, PPARgamma. These receptors have been thought to be directly involved in the regulation of the inflammatory response in several animal models of neuropathologies having a clear associated inflammatory component . PPARgamma also possesses a great number of synthetic ligands such as the family of anti-diabetic drugs known as thiazolidinediones (TZDs), which include rosiglitazone, troglitazone, pioglitazone, ciglitazone and rivoglitazone . PPARgamma and its ligands are master regulators of cerebral physiology and potential therapeutic targets for the treatment of several pathological conditions within the CNS. This promising anti-inflammatory pathway is also strongly related to stress exposure. We have demonstrated that both synthetic and natural PPARgamma ligands prevent the inflammatory and oxidative/nitrosative consequences of stress exposure in the CNS of rats subjected to immobilization stress [91,92]. The mechanisms by which these compounds prevent these effects include inhibition of stress (acute and chronic)-induced increase in iNOS activity, NF-kappaB blockade (by preventing stress-induced IκBa decrease) and inhibition of TNF-alpha release in stressed animals. Other research has indicated the capacity of the PPARgamma agonists (TZDs and 15d-PGJ2) to reduce the expression of the pro-inflammatory cytokine TNF-alpha and iNOS, gelatinase B (MMP-9) and COX-2 in LPS-stimulated macrophages in glial cells and neurons. These proteins contribute to the inflammatory damage observed in certain neurological diseases . PPARgamma agonists may also activate antioxidant pathways such as nuclear factor (erythroid-derived 2)-like 2 (Nrf2) . The neuroprotection afforded by treatment with PPARgamma agonists is extended to prolonged restraint stress paradigms (7 or 14 consecutive days). In this way, treatment with PPARgamma agonists exerts direct protective action on the cerebral glucose and glutamate metabolism disrupted after stress exposure (regulating the expression of the neuronal glucose transporter GLUT-3 and the predominant glial glutamate transporter EAAT-2), mechanisms to add to its above-discussed anti-inflammatory/antioxidant effects, adding new therapeutic implications to the management of patients at risk of stressful events . All of these findings clearly support the view that immobilization stress activates PPARgamma in the brain, and pharmacological manipulation of intrinsic pathways such as PPARgamma could provide protection in neuroinflammatory conditions. A question of further interest is the possibility that this pathway serves as a mediator of “central neurogenic neuroprotection” or “adaptive plasticity”, as proposed in the stressed brain. It has been recently demonstrated that this pathway is finely regulated in the brain by stress hormones, including catecholamines, glucocorticoids and excitatory amino acids . The possible use of exogenously administered PGJ2 as a tool to maintain anti-inflammatory balance in this condition deserves special attention. In fact, expression of COX-2 can be up- or down-regulated in situations of neuroinflammation. In basal conditions (inactivated stage), physiological PGD2 metabolites such as PGJ2 closes a negative feedback loop on COX-2 expression, whereas in activated stages, such as stress, COX-2 is activated by enhanced levels of PGD2 metabolites, with production of its main product, PGE2. By administering supra-physiological doses of PGJ2, one could expect an inhibition in COX-2 expression and PGE2 production, as seen in different models . Accordingly, exogenous administration of PGJ2 should exert a more powerful anti-inflammatory effect, as it occurs in the case of the antipyretic effect of this endogenous ligand. Thus, the anti-inflammatory effect of PGJ2 is more apparent in stressful situations than in resting status, due to induction of endogenous PGJ2 production, which, when combined with exogenous 15d-PGJ2, could exert a more powerful effect . These observations support the rationale of using supra-physiological doses of PGJ2 as a possible therapeutic approach. In addition, PPARs are constitutively expressed in vascular related cells and the treatment with their agonists could regulate the abnormal cerebral blood flow and glucose metabolism reported in individuals with psychiatric disease [97-99]. Its constitutive presence in endothelial and perivascular cells (a subset of brain-resident macrophages) suggest an important role regulating the infiltration of immune cells across the BBB, its permeability (regulation of expression and activity of matrix metalloproteases ), and the transduction of peripheral immune signals (as GCs, proinflammatory cytokines and prostaglandins) within the brain parenchyma to initiate a potentially deleterious neuroinflammatory process. In a remarkable and novel mechanism, the TZD rosiglitazone might improve cognition by increasing dendritic spine density in discrete brain areas . The precise mechanism might involve increased mitochondrial biogenesis or function, improving synaptogenesis and memory formation . PPARgamma interactions with mitochondria are especially attractive because mitochondrial abnormalities and deficiencies in oxidative phosphorylation have been reported in individuals with neuropsychiatric diseases such as schizophrenia, bipolar disorder, and major depressive disorder, correlating increased psychiatric symptoms with declines in mitochondrial functional activity [102,103]. In the last years clinical and experimental evidence has contributed to support the notion that psychosocial stress can activate the inflammatory response not only in the brain, but also in periphery. For example, peripheral blood mononuclear cells from healthy human volunteers subjected to stress (public speaking and mental arithmetic stressor) show significant increases in NF-kappaB activity. Furthermore, chronic stress in humans has been associated with increases in C-reactive protein (CRP), as well as IL-6 and other inflammatory mediators (reviewed in reference 104). Worth mentioning, it seems that the mechanisms of stress-induced activation of immune responses involve both sympathetic nervous system (SNS) and HPA axis pathways. Thus, as previously described (see point 2) glucocorticoids and neurotransmitters released in stress induce pro-inflammatory cytokines release (including IL-1beta, TNF-alpha and IL-6) and expression of their receptors. However, further investigation is required to fully understand the mechanisms involved in these effects. Since description of the “General Adaptation Syndrome” by Selye it has been universally accepted that the stress exposure has consequences not only in the CNS but also in other regions of the organism (e.g. adrenal glands, immune organs, digestive system). As a consequence, the actions of stress on the immune system have been and are studied in depth, and in the last years the scientific research focus on the innate immunity and particularly on the neuroinflammatory actions of the Toll-like receptors (TLRs). TLRs are key regulators and play essential roles in generating innate immune responses and specifically recognize the conserved microbial structural motifs referred as pathogen-associated molecular patterns (PAMPs) . Ligand recognition by TLRs activates signaling cascades (including the activation of the transcription factor NF-kappaB and the activation of the MAP kinases p38 and JNK) that culminate in the transcription of many pro-inflammatory genes that encode cytokines, chemokines, and enzymes such as COX-2 or iNOS, which are events involved in the neuroinflammation detected after psychological stress exposure. Moreover, the presence of some TLRs (e.g. TLR2, TLR4) has been observed in microglia, astrocytes and neurons after inflammation in the CNS . On the other hand, endogenous molecules released from disrupted cells and extracellular matrix degradation products also activate TLRs, and thus may contribute to immune activation (an inflammation) after tissue injury . Interestingly, this activation by endogenous molecules can take place during the stress response: stress releases mediators that have been identified as ligands of TLRs such as heat shock proteins (e.g. HSP-60, which is an endogenous ligand of TLR4) . There is evidence that psychological stress changes TLRs expression in the brain, (Gárate et al., personal communication), and there are data from other organs (such as in respiratory epithelial cells) indicating that is a plausible situation. Moreover it has been shown that TLR4-deficient mice after immobilization stress have a better behavioral condition compared with mice that express TLR4 normally, and that this effect is associated with a decreased inflammatory response (COX-2 and iNOS expression), and lipid peroxidation in brain tissue . Similarly, another study has found that TLR4-deficient mice are resistant to chronic restraint stress-induced lymphocyte reduction, showing that in this condition, stress modulates the immune system through a TLR4-dependent mechanism . Apart from the actions on the immune system, psychological stress is widely accepted as trigger and/or modifier of the clinical course of a variety of gastrointestinal diseases including the inflammatory bowel disease (IBD). In this respect, it has been shown that immobilization stress induces macroscopic and histological colonic inflammation, increasing iNOS activity and membrane lipid peroxidation and increasing COX-2 expression . Also, it has been shown that exposure to immobilization stress induces weight loss and neutrophil infiltration in the colonic mucosa. Interestingly, these effects are accompanied by a morphological and functional alteration of the colonic epithelial barrier, allowing the pass of microflora from the intestines to other organs such as mesenteric lymph nodes, liver and spleen . In addition, showing again the importance of the actions of the stress on the immune system, it has been described that immobilization stress induces a decrease in the levels of colonic immunoglobulin A (IgA). Secretion of IgA represents a first line of defense against pathogens in the mucosal surfaces by means of, among other mechanisms, agglutinating bacteria and preventing them from binding to intestinal epithelial cells. Therefore, a decrease in the amount of IgA in the colonic lumen could contribute, together with an increased colonic permeability related to tight junctions (TJs) disruption, to bacterial translocation and increased antigen uptake. Summarizing this, growing evidence from experimental studies is supporting the concept that psychological stress can lead to acute intestinal inflammatory response and barrier dysfunction, resulting in bacterial translocation and enhanced uptake of luminal antigens, which, consequently, are associated with maintained stimulation of lamina propria and submucosa immune cells, and finally with chronic inflammation. It is important to point out that the pro-inflammatory actions of the stress on the intestinal mucosa and the subsequent intestinal barrier dysfunction may have effects not only on the prognosis of gastrointestinal disorders, but also in other pathologies with an inflammatory component. For instance, it is well known that the inflammation is an important component of the stroke damage, and also that infections are the leading cause of death in the post-acute phase of this pathology. The intestinal dysfunction induced by stress has been related with the bacterial translocation detected in a model of immobilization stress, worsening the experimental stroke outcome , and bearing in mind that CNS injury significantly increases susceptibility to infection, the pharmacological modulation of this pathway represents a possible therapeutic approach in stress-related disorders, and particularly in CNS disorders such as brain ischemia. Furthermore, long time exposure to stress is known to increase the onset and course of cardiovascular diseases, immunological disorders and pathophysiological consequences of normal aging. The inability to cope with life events, which leads to the hyper secretion of corticosteroids, imposes an increased risk for depression, as well as increased abdominal obesity, osteoporosis and cardiovascular problems . Further investigation is required to discover the mechanisms involved in these gastrointestinal effects. However, it is known that stress-related factors, such as CRH and GCs can increase intestinal permeability. Consequently, a possible explanation for the effects of the stress on the intestinal integrity can be the increase in CRH and GC levels induced by stress. Nonetheless, there are other stress-related factors that can be playing a role in the stress actions on the digestive system. These can be, among others, the release of pro-inflammatory molecules such as cytokines and prostaglandins, and the activation of the sympathetic nervous system (SNS). 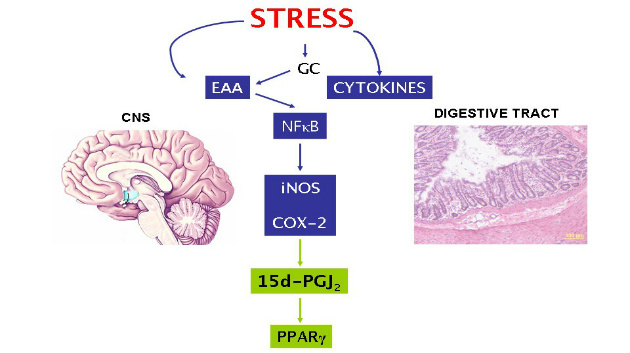 Interestingly, as it has been described in brain, stress also leads to an early induction of PPARgamma expression and 15d-PGJ2 synthesis in the colon (probably as a compensatory mechanism), and the stress-induced inflammation and dysfunction of the intestinal barrier is prevented with both natural and synthetic PPARgamma ligands (i.e. 15d-PGJ2 and rosiglitazone) . In consequence, the PPARgamma pathway represents not only a promising therapeutic approach for the treatment of the actions of the stress on the CNS, but also to prevent the effects of the stress on the digestive system. The study of the brain response to stress (acute and chronic) is of great importance for several main reasons: first, because stress underlies any pathological condition in humans, therefore, all diseases carry a certain degree of stress; second, because response to stress is a defensive mechanisms: It is a physiological process, at least initially, and it needs to be conserved and not abolished with widespread blocking of adrenal function; third, in the recent years data from many research groups indicate that in the brain, stress produces a response comparable to the one that takes place in many neurodegenerative diseases (excitotoxicity, inflammation, and eventually cell death); fourth, there are specific psychiatric disorders caused by long time or high intensity stress exposure, the so-called post-traumatic stress disorder, but others are related to exposure to stressful situations (mainly depression); furthermore, stress modify the onset or severity of many other pathologies (cardiovascular, gastrointestinal); finally, a compensatory mechanisms has been described to control inflammatory responses in brain and other organs after stress exposure (Figure 1). Figure 1. Brain and other organs after stress exposure. Pro- (in blue) and anti-inflammatory (in green) pathways in the brain and the digestive tract after stress exposure (see text for details). Abbreviations used: COX-2, Cyclooxygenase 2; 15d-PGJ2, 15-deoxy-Prostaglandin J2; EAA: Excitatory amino acids; GC: Glucocorticoids; iNOS, Inducible nitric oxide synthase; NF-kappaB, Nuclear factor kappa B; PPAR, Peroxisome proliferator activated receptor. Overall, data reviewed here indicate that excitatory amino acids and consequent NF-kappaB activation cause the expression and activation of iNOS and COX-2 in cerebral cortex and hippocampus, and support a possible neuroprotective role for the specific inhibitors in these situations. Taking into account the role of these enzymes as initiators of the excessive glutamate and TNF-alpha release, the use of drugs to reduce their action might be useful to minimize or even prevent brain damage in humans. Also agents that potentiate the anti-inflammatory pathway 15d-PGJ2/PPARgamma might be useful to control stress-derived consequences in brain. The experimental tools tested so far should be directed to design molecules that could be administered to humans with stress of long duration or intensity. In conclusion, it seems that a new pharmacological approach is emerging to reduce the accumulation of oxidizing molecules in the brain that occurs after prolonged exposure to stress. Ongoing research should verify the validity of these new drug categories used alone or in combination with antidepressant, anxiolytic and neuroprotective properties currently available. Selye H. Further thoughts on “stress without distress”. Med Times 1976; 104(11): 124-44. Sapolsky RM. Stress, Glucocorticoids, and Damage to the Nervous System: The Current State of Confusion. Stress 1996; 1(1): 1-19. Black PH, Garbutt LD. Stress, inflammation and cardiovascular disease. J Psychosom Res 2002; 52(1): 1-23. Dunn AJ, Wang J, Ando T. Effects of cytokines on cerebral neurotransmission. Comparison with the effects of stress. Adv Exp Med Biol 1999; 461: 117-27. Reul JM, Labeur MS, Wiegers GJ, Linthorst AC. Altered neuroimmunoendocrine communication during a condition of chronically increased brain corticotropin-releasing hormone drive. Ann N Y Acad Sci 1998; 840: 444-55. Axelrod J, Reisine TD. Stress hormones: their interaction and regulation. Science 1984; 224(4648): 452-9.
de Kloet CS, Vermetten E, Geuze E, Kavelaars A, Heijnen CJ, Westenberg HG. Assessment of HPA-axis function in posttraumatic stress disorder: pharmacological and non-pharmacological challenge tests, a review. J Psychiatr Res 2006; 40(6): 550-67. Whitnall MH. Regulation of the hypothalamic corticotropin-releasing hormone neurosecretory system. Prog Neurobiol 1993; 40(5): 573-629. Sorrells SF, Sapolsky RM. An inflammatory review of glucocorticoid actions in the CNS. Brain Behav Immun 2007; 21(3): 259-72.
de Pablos RM, Villaran RF, Arguelles S, Herrera AJ, Venero JL, Ayala A et al. Stress increases vulnerability to inflammation in the rat prefrontal cortex. J Neurosci 2006; 26(21): 5709-19. Munhoz C, Madrigal JL, Garcia-Bueno B, Pradillo JM, Moro MA, Lizasoain I et al. TNF-alpha accounts for short-term persistence of oxidative status in rat brain after two weeks of repeated stress. Eur J Neurosci 2004; 20(4): 1125-30. Dinkel K, MacPherson A, Sapolsky RM. Novel glucocorticoid effects on acute inflammation in the CNS. J Neurochem 2003; 84(4): 705-16. MacPherson A, Dinkel K, Sapolsky R. Glucocorticoids worsen excitotoxin-induced expression of pro-inflammatory cytokines in hippocampal cultures. Exp Neurol 2005; 194(2): 376-83. Allan SM, Rothwell NJ. Inflammation in central nervous system injury. Philos Trans R Soc Lond B Biol Sci 2003; 358(1438): 1669-77. Gonzalez-Scarano F, Baltuch G. Microglia as mediators of inflammatory and degenerative diseases. Annu Rev Neurosci 1999; 22: 219-40. Dantzer R, O”Connor JC, Freund GG, Johnson RW, Kelley KW. From inflammation to sickness and depression: when the immune system subjugates the brain. Nat Rev Neurosci 2008; 9(1): 46-56. Hanson DR, Gottesman II. Theories of schizophrenia: a genetic-inflammatory-vascular synthesis. BMC Med Genet 2005; 6: 7. Virgin CE, Jr., Ha TP, Packan DR, Tombaugh GC, Yang SH, Horner HC, Sapolsky RM. Glucocorticoids inhibit glucose transport and glutamate uptake in hippocampal astrocytes: implications for glucocorticoid neurotoxicity. J Neurochem 1991; 57(4): 1422-8. Moghaddam B. Stress preferentially increases extraneuronal levels of excitatory amino acids in the prefrontal cortex: comparison to hippocampus and basal ganglia. J Neurochem 1993; 60(5): 1650-7. Madrigal JL, Moro MA, Lizasoain I, Lorenzo P, Castrillo A, Bosca L, Leza JC. Inducible nitric oxide synthase expression in brain cortex after acute restraint stress is regulated by nuclear factor kappaB-mediated mechanisms. J Neurochem 2001; 76(2): 532-8. Madrigal JL, Hurtado O, Moro MA, Lizasoain I, Lorenzo P, Castrillo A et al. The increase in TNF-alpha levels is implicated in NF-kappaB activation and inducible nitric oxide synthase expression in brain cortex after immobilization stress. Neuropsychopharmacology 2002; 26(2): 155-63. Bierhaus A, Wolf J, Andrassy M, Rohleder N, Humpert PM, Petrov D et al. A mechanism converting psychosocial stress into mononuclear cell activation. Proc Natl Acad Sci U S A 2003; 100(4): 1920-5. Gross SS, Wolin MS. Nitric oxide: pathophysiological mechanisms. Annu Rev Physiol 1995; 57: 737-69. Moncada S, Palmer RM, Higgs EA. Nitric oxide: physiology, pathophysiology, and pharmacology. Pharmacol Rev 1991; 43(2): 109-42. Olivenza R, Moro MA, Lizasoain I, Lorenzo P, Fernandez AP, Rodrigo J et al. Chronic stress induces the expression of inducible nitric oxide synthase in rat brain cortex. J Neurochem 2000; 74(2): 785-91. Seibert K, Masferrer J, Zhang Y, Leahy K, Hauser S, Gierse J et al. Expression and selective inhibition of constitutive and inducible forms of cyclooxygenase. Adv Prostaglandin Thromboxane Leukot Res 1995; 23: 125-7. Bezzi P, Carmignoto G, Pasti L, Vesce S, Rossi D, Rizzini BL et al. Prostaglandins stimulate calcium-dependent glutamate release in astrocytes. Nature 1998; 391(6664): 281-5. Takadera T, Yumoto H, Tozuka Y, Ohyashiki T. Prostaglandin E(2) induces caspase-dependent apoptosis in rat cortical cells. Neurosci Lett 2002; 317(2): 61-4. Egan RW, Paxton J, Kuehl FA, Jr. Mechanism for irreversible self-deactivation of prostaglandin synthetase. J Biol Chem 1976; 251(23): 7329-35. Ackerman KD, Martino M, Heyman R, Moyna NM, Rabin BS. Stressor-induced alteration of cytokine production in multiple sclerosis patients and controls. Psychosom Med 1998; 60(4): 484-91. Holden RJ, Pakula IS. Tumor necrosis factor-alpha: is there a continuum of liability between stress, anxiety states and anorexia nervosa? Med Hypotheses 1999; 52(2): 155-62. Maes M, Song C, Lin A, De JR, Van GA, Kenis G et al. The effects of psychological stress on humans: increased production of pro-inflammatory cytokines and a Th1-like response in stress-induced anxiety. Cytokine 1998; 10(4): 313-8. Minami M, Kuraishi Y, Yamaguchi T, Nakai S, Hirai Y, Satoh M. Immobilization stress induces interleukin-1 beta mRNA in the rat hypothalamus. Neurosci Lett 1991; 123(2): 254-6. Nukina H, Sudo N, Komaki G, Yu X, Mine K, Kubo C. The restraint stress-induced elevation in plasma interleukin-6 negatively regulates the plasma TNF-alpha level. Neuroimmunomodulation 1998; 5(6): 323-7. Shintani F, Nakaki T, Kanba S, Sato K, Yagi G, Shiozawa M et al. Involvement of interleukin-1 in immobilization stress-induced increase in plasma adrenocorticotropic hormone and in release of hypothalamic monoamines in the rat. J Neurosci 1995; 15(3 Pt 1): 1961-70. Yamasu K, Shimada Y, Sakaizumi M, Soma G, Mizuno D. Activation of the systemic production of tumor necrosis factor after exposure to acute stress. Eur Cytokine Netw 1992; 3(4): 391-8. DeRijk R, Michelson D, Karp B, Petrides J, Galliven E, Deuster P et al. Exercise and circadian rhythm-induced variations in plasma cortisol differentially regulate interleukin-1 beta (IL-1 beta), IL-6, and tumor necrosis factor-alpha (TNF alpha) production in humans: high sensitivity of TNF alpha and resistance of IL-6. J Clin Endocrinol Metab 1997; 82(7): 2182-91. Wang CX, Shuaib A. Involvement of inflammatory cytokines in central nervous system injury. Prog Neurobiol 2002; 67(2): 161-72. Smith RA, Baglioni C. Characterization of TNF receptors. Immunol Ser 1992; 56: 131-47. Black RA, White JM. ADAMs: focus on the protease domain. Curr Opin Cell Biol 1998; 10(5): 654-9. Hurtado O, Cardenas A, Lizasoain I, Bosca L, Leza JC, Lorenzo P, Moro MA. Up-regulation of TNF-alpha convertase (TACE/ADAM17) after oxygen-glucose deprivation in rat forebrain slices. Neuropharmacology 2001; 40(8): 1094-102. Hurtado O, Lizasoain I, Fernandez-Tome P, varez-Barrientos A, Leza JC, Lorenzo P, Moro MA. TACE/ADAM17-TNF-alpha pathway in rat cortical cultures after exposure to oxygen-glucose deprivation or glutamate. J Cereb Blood Flow Metab 2002; 22(5): 576-85. Skovronsky DM, Fath S, Lee VM, Milla ME. Neuronal localization of the TNFalpha converting enzyme (TACE) in brain tissue and its correlation to amyloid plaques. J Neurobiol 2001; 49(1): 40-6. Goddard DR, Bunning RA, Woodroofe MN. Astrocyte and endothelial cell expression of ADAM 17 (TACE) in adult human CNS. Glia 2001; 34(4): 267-71. Kupatt C, Habazettl H, Goedecke A, Wolf DA, Zahler S, Boekstegers P et al. Tumor necrosis factor-alpha contributes to ischemia- and reperfusion-induced endothelial activation in isolated hearts. Circ Res 1999; 84(4): 392-400. Watts AD, Hunt NH, Madigan MC, Chaudhri G. Soluble TNF-alpha receptors bind and neutralize over-expressed transmembrane TNF-alpha on macrophages, but do not inhibit its processing. J Leukoc Biol 1999; 66(6): 1005-13. Rothwell NJ, Luheshi GN. Interleukin 1 in the brain: biology, pathology and therapeutic target. Trends Neurosci 2000; 23(12): 618-25. Lucas SM, Rothwell NJ, Gibson RM. The role of inflammation in CNS injury and disease. Br J Pharmacol 2006; 147 Suppl 1: S232-S240. Johnson JD, Campisi J, Sharkey CM, Kennedy SL, Nickerson M, Greenwood BN, Fleshner M. Catecholamines mediate stress-induced increases in peripheral and central inflammatory cytokines. Neuroscience 2005; 135(4): 1295-307. Suzuki E, Shintani F, Kanba S, Asai M, Nakaki T. Immobilization stress increases mRNA levels of interleukin-1 receptor antagonist in various rat brain regions. Cell Mol Neurobiol 1997; 17(5): 557-62. Nguyen KT, Deak T, Owens SM, Kohno T, Fleshner M, Watkins LR, Maier SF. Exposure to acute stress induces brain interleukin-1beta protein in the rat. J Neurosci 1998; 18(6): 2239-46. Maier SF, Nguyen KT, Deak T, Milligan ED, Watkins LR. Stress, learned helplessness, and brain interleukin-1 beta. Adv Exp Med Biol 1999; 461: 235-49. Deak T, Bellamy C, D”Agostino LG. Exposure to forced swim stress does not alter central production of IL-1. Brain Res 2003; 972(1-2): 53-63. O”Connor KA, Johnson JD, Hansen MK, Wieseler Frank JL, Maksimova E, Watkins LR, Maier SF. Peripheral and central proinflammatory cytokine response to a severe acute stressor. Brain Res 2003; 991(1-2): 123-32. Maier SF, Watkins LR. Cytokines for psychologists: implications of bidirectional immune-to-brain communication for understanding behavior, mood, and cognition. Psychol Rev 1998; 105(1): 83-107. Pugh CR, Nguyen KT, Gonyea JL, Fleshner M, Wakins LR, Maier SF, Rudy JW. Role of interleukin-1 beta in impairment of contextual fear conditioning caused by social isolation. Behav Brain Res 1999; 106(1-2): 109-18. Chai Z, Gatti S, Toniatti C, Poli V, Bartfai T. Interleukin (IL)-6 gene expression in the central nervous system is necessary for fever response to lipopolysaccharide or IL-1 beta: a study on IL-6-deficient mice. J Exp Med 1996; 183(1): 311-6. Kozak W, Kluger MJ, Soszynski D, Conn CA, Rudolph K, Leon LR, Zheng H. IL-6 and IL-1 beta in fever. Studies using cytokine-deficient (knockout) mice. Ann N Y Acad Sci 1998; 856: 33-47. Oka T, Oka K, Hori T. Mechanisms and mediators of psychological stress-induced rise in core temperature. Psychosom Med 2001; 63(3): 476-86. LeMay LG, Vander AJ, Kluger MJ. The effects of psychological stress on plasma interleukin-6 activity in rats. Physiol Behav 1990; 47(5): 957-61. Zhou D, Kusnecov AW, Shurin MR, DePaoli M, Rabin BS. Exposure to physical and psychological stressors elevates plasma interleukin 6: relationship to the activation of hypothalamic-pituitary-adrenal axis. Endocrinology 1993; 133(6): 2523-30. Takaki A, Huang QH, Somogyvari-Vigh A, Arimura A. Immobilization stress may increase plasma interleukin-6 via central and peripheral catecholamines. Neuroimmunomodulation 1994; 1(6): 335-42. Kronfol Z, Remick DG. Cytokines and the brain: implications for clinical psychiatry. Am J Psychiatry 2000; 157(5): 683-94. Butterweck V, Prinz S, Schwaninger M. The role of interleukin-6 in stress-induced hyperthermia and emotional behaviour in mice. Behav Brain Res 2003; 144(1-2): 49-56. Swiergiel AH, Dunn AJ. Feeding, exploratory, anxiety- and depression-related behaviors are not altered in interleukin-6-deficient male mice. Behav Brain Res 2006; 171(1): 94-108. Ambrosini E, Aloisi F. Chemokines and glial cells: a complex network in the central nervous system. Neurochem Res 2004; 29(5): 1017-38. Belmadani A, Tran PB, Ren D, Miller RJ. Chemokines regulate the migration of neural progenitors to sites of neuroinflammation. J Neurosci 2006; 26(12): 3182-91. Widera D, Holtkamp W, Entschladen F, Niggemann B, Zanker K, Kaltschmidt B, Kaltschmidt C. MCP-1 induces migration of adult neural stem cells. Eur J Cell Biol 2004; 83(8): 381-7. Stamatovic SM, Dimitrijevic OB, Keep RF, Andjelkovic AV. Protein kinase Calpha-RhoA cross-talk in CCL2-induced alterations in brain endothelial permeability. J Biol Chem 2006; 281(13): 8379-88. Banisadr G, Gosselin RD, Mechighel P, Kitabgi P, Rostene W, Parsadaniantz SM. Highly regionalized neuronal expression of monocyte chemoattractant protein-1 (MCP-1/CCL2) in rat brain: evidence for its colocalization with neurotransmitters and neuropeptides. J Comp Neurol 2005; 489(3): 275-92. Banisadr G, Gosselin RD, Mechighel P, Rostene W, Kitabgi P, Melik PS. Constitutive neuronal expression of CCR2 chemokine receptor and its colocalization with neurotransmitters in normal rat brain: functional effect of MCP-1/CCL2 on calcium mobilization in primary cultured neurons. J Comp Neurol 2005; 492(2): 178-92. Bruno V, Copani A, Besong G, Scoto G, Nicoletti F. Neuroprotective activity of chemokines against N-methyl-D-aspartate or beta-amyloid-induced toxicity in culture. Eur J Pharmacol 2000; 399(2-3): 117-21. Eugenin EA, D”Aversa TG, Lopez L, Calderon TM, Berman JW. MCP-1 (CCL2) protects human neurons and astrocytes from NMDA or HIV-tat-induced apoptosis. J Neurochem 2003; 85(5): 1299-311. Katayama T, Minami M, Nakamura M, Ito M, Katsuki H, Akaike A, Satoh M. Excitotoxic injury induces production of monocyte chemoattractant protein-1 in rat cortico-striatal slice cultures. Neurosci Lett 2002; 328(3): 277-80. Szaflarski J, Ivacko J, Liu XH, Warren JS, Silverstein FS. Excitotoxic injury induces monocyte chemoattractant protein-1 expression in neonatal rat brain. Brain Res Mol Brain Res 1998; 55(2): 306-14. Madrigal JL, Leza JC, Polak P, Kalinin S, Feinstein DL. Astrocyte-derived MCP-1 mediates neuroprotective effects of noradrenaline. J Neurosci 2009; 29(1): 263-7. Braun MC, Lahey E, Kelsall BL. Selective suppression of IL-12 production by chemoattractants. J Immunol 2000; 164(6): 3009-17. Zisman DA, Kunkel SL, Strieter RM, Tsai WC, Bucknell K, Wilkowski J, Standiford TJ. MCP-1 protects mice in lethal endotoxemia. J Clin Invest 1997; 99(12): 2832-6. Dessing MC, van der Sluijs KF, Florquin S, van der PT. Monocyte chemoattractant protein 1 contributes to an adequate immune response in influenza pneumonia. Clin Immunol 2007; 125(3): 328-36. El KJ, Toft M, Hickman SE, Means TK, Terada K, Geula C, Luster AD. Ccr2 deficiency impairs microglial accumulation and accelerates progression of Alzheimer-like disease. Nat Med 2007; 13(4): 432-8. Kiyota T, Yamamoto M, Xiong H, Lambert MP, Klein WL, Gendelman HE et al. CCL2 accelerates microglia-mediated Abeta oligomer formation and progression of neurocognitive dysfunction. PLoS One 2009; 4(7): e6197. Bremner JD, Krystal JH, Southwick SM, Charney DS. Noradrenergic mechanisms in stress and anxiety: I. Preclinical studies. Synapse 1996; 23(1): 28-38. Madrigal JL, Garcia-Bueno B, Hinojosa AE, Polak P, Feinstein DL, Leza JC. Regulation of MCP-1 production in brain by stress and noradrenaline-modulating drugs. J Neurochem 2010; 113(2): 543-51. Kawahara RS, Deng ZW, Deuel TF. Glucocorticoids inhibit the transcriptional induction of JE, a platelet-derived growth factor-inducible gene. J Biol Chem 1991; 266(20): 13261-6. Zhou Y, Ling EA, Dheen ST. Dexamethasone suppresses monocyte chemoattractant protein-1 production via mitogen activated protein kinase phosphatase-1 dependent inhibition of Jun N-terminal kinase and p38 mitogen-activated protein kinase in activated rat microglia. J Neurochem 2007; 102(3): 667-78. Little AR, Sriram K, O”Callaghan JP. Corticosterone regulates expression of CCL2 in the intact and chemically injured hippocampus. Neurosci Lett 2006; 399(1-2): 162-6. Mizobe K, Kishihara K, Ezz-Din El-Naggar R, Madkour GA, Kubo C, Nomoto K. Restraint stress-induced elevation of endogenous glucocorticoid suppresses migration of granulocytes and macrophages to an inflammatory locus. J Neuroimmunol 1997; 73(1-2): 81-9. Feinstein DL. Therapeutic potential of peroxisome proliferator-activated receptor agonists for neurological disease. Diabetes Technol Ther 2003; 5(1): 67-73. Lehmann JM, Moore LB, Smith-Oliver TA, Wilkison WO, Willson TM, Kliewer SA. An antidiabetic thiazolidinedione is a high affinity ligand for peroxisome proliferator-activated receptor gamma (PPAR gamma). J Biol Chem 1995; 270(22): 12953-6. Garcia-Bueno B, Madrigal JL, Lizasoain I, Moro MA, Lorenzo P, Leza JC. Peroxisome proliferator-activated receptor gamma activation decreases neuroinflammation in brain after stress in rats. Biol Psychiatry 2005; 57(8): 885-94. Garcia-Bueno B, Madrigal JL, Lizasoain I, Moro MA, Lorenzo P, Leza JC. The anti-inflammatory prostaglandin 15d-PGJ2 decreases oxidative/nitrosative mediators in brain after acute stress in rats. Psychopharmacology (Berl) 2005; 180(3): 513-22. Park EY, Cho IJ, Kim SG. Transactivation of the PPAR-responsive enhancer module in chemopreventive glutathione S-transferase gene by the peroxisome proliferator-activated receptor-gamma and retinoid X receptor heterodimer. Cancer Res 2004; 64(10): 3701-13. Garcia-Bueno B, Caso JR, Perez-Nievas BG, Lorenzo P, Leza JC. Effects of peroxisome proliferator-activated receptor gamma agonists on brain glucose and glutamate transporters after stress in rats. Neuropsychopharmacology 2007; 32(6): 1251-60. Garcia-Bueno B, Madrigal JL, Perez-Nievas BG, Leza JC. Stress mediators regulate brain prostaglandin synthesis and peroxisome proliferator-activated receptor-gamma activation after stress in rats. Endocrinology 2008; 149(4): 1969-78. Mouihate A, Boisse L, Pittman QJ. A novel antipyretic action of 15-deoxy-Delta12,14-prostaglandin J2 in the rat brain. J Neurosci 2004; 24(6): 1312-8. Buchsbaum MS, Hazlett EA. Positron emission tomography studies of abnormal glucose metabolism in schizophrenia. Schizophr Bull 1998; 24(3): 343-64. Drevets WC. Functional neuroimaging studies of depression: the anatomy of melancholia. Annu Rev Med 1998; 49: 341-61. Pereira MP, Hurtado O, Cardenas A, Alonso-Escolano D, Bosca L, Vivancos J et al. The nonthiazolidinedione PPARgamma agonist L-796,449 is neuroprotective in experimental stroke. J Neuropathol Exp Neurol 2005; 64(9): 797-805. Brodbeck J, Balestra ME, Saunders AM, Roses AD, Mahley RW, Huang Y. Rosiglitazone increases dendritic spine density and rescues spine loss caused by apolipoprotein E4 in primary cortical neurons. Proc Natl Acad Sci U S A 2008; 105(4): 1343-6. Jou SH, Chiu NY, Liu CS. Mitochondrial dysfunction and psychiatric disorders. Chang Gung Med J 2009; 32(4): 370-9. Rollins B, Martin MV, Sequeira PA, Moon EA, Morgan LZ, Watson SJ et al. Mitochondrial variants in schizophrenia, bipolar disorder, and major depressive disorder. PLoS One 2009; 4(3): e4913. Miller AH, Maletic V, Raison CL. Inflammation and its discontents: the role of cytokines in the pathophysiology of major depression. Biol Psychiatry 2009; 65(9): 732-41. Janeway CA, Jr., Medzhitov R. Innate immune recognition. Annu Rev Immunol 2002; 20: 197-216. Garcia-Bueno B, Caso JR, Leza JC. Stress as a neuroinflammatory condition in brain: damaging and protective mechanisms. Neurosci Biobehav Rev 2008; 32(6): 1136-51. Koedel U, Merbt UM, Schmidt C, Angele B, Popp B, Wagner H et al. Acute brain injury triggers MyD88-dependent, TLR2/4-independent inflammatory responses. Am J Pathol 2007; 171(1): 200-13. Lewthwaite J, Owen N, Coates A, Henderson B, Steptoe A. Circulating human heat shock protein 60 in the plasma of British civil servants: relationship to physiological and psychosocial stress. Circulation 2002; 106(2): 196-201. Caso JR, Pradillo JM, Hurtado O, Leza JC, Moro MA, Lizasoain I. Toll-like receptor 4 is involved in subacute stress-induced neuroinflammation and in the worsening of experimental stroke. Stroke 2008; 39(4): 1314-20. Zhang Y, Woodruff M, Zhang Y, Miao J, Hanley G, Stuart C et al. Toll-like receptor 4 mediates chronic restraint stress-induced immune suppression. J Neuroimmunol 2008; 194(1-2): 115-22. Ponferrada A, Caso JR, Alou L, Colon A, Sevillano D, Moro MA et al. The role of PPARgamma on restoration of colonic homeostasis after experimental stress-induced inflammation and dysfunction. Gastroenterology 2007; 132(5): 1791-803. Brown ES, Varghese FP, McEwen BS. Association of depression with medical illness: does cortisol play a role? Biol Psychiatry 2004; 55(1): 1-9.